Wayne shares his recipe for rosemary marinated chicken, grilled vegetables, roasted garlic and fresh herbs over pasta. Summertime treat: pasta with rosemary chicken, roasted garlic and grilled vegetables and fresh herbs. This is the time of year when farmer’s markets are full of fresh vegetables and herbs. It’s also the time of year when we all love to grill. So, it makes all the sense in the world to combine the two. 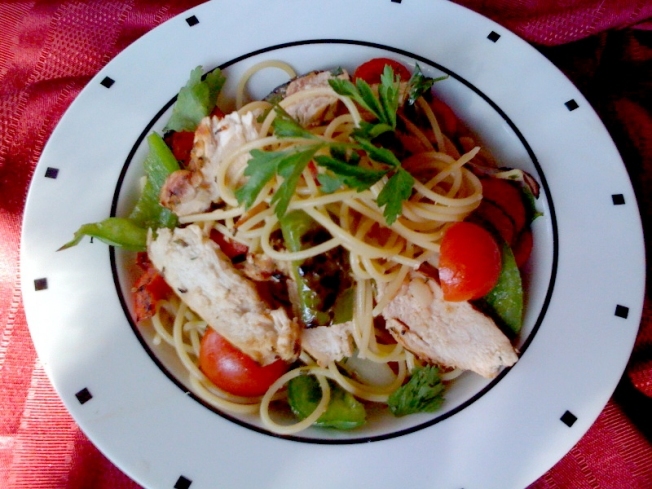 This dish uses fresh rosemary in the marinade for the chicken and herbs and grilled vegetables mixed in with the pasta. The roasted garlic adds a nice pop of flavor, too. To make the marinade, pour lemon juice and zest into a medium sized bowl and whisk in 1/4 cup olive oil. Add rosemary, salt and pepper and stir to combine. Place chicken breasts in a large sealable plastic bag. Pour marinade over chicken and remove as much air as possible from the bag before sealing. Refrigerate for 1-2 hours (or longer if you like). Mix tomatoes, oregano and parsley together in a bowl and set aside. When chicken is ready to be cooked, prepare your grill. Take the garlic and it across the top revealing the tops of the cloves. Place it in a piece of aluminum large enough to enclose it and drizzle a bit of olive oil on top. Seal the aluminum and place it on the grill for about 10-12 minutes. Remove from grill and let rest until it has cooled. Remove chicken from plastic bag and discard extra marinade. Grill chicken until cooked through. Remove from grill and let chicken reast for 10 minutes before slicing. Meanwhile prepare pasta according to package directions. Toss vegetables in about 1 tablespoon of olive oil and place them in a basket or on a mesh screen and grill for 4-5 minutes per side or until slightly charred and tender. Remove from grill. Drain pasta and toss with 1-2 tablespoons of olive oil. Remove garlic from aluminum and invert it on a cutting board. Squeeze out the garlic and chop it finely. Add garlic, tomatoes, oregano and parsley to pasta and toss. Slice chicken into bite size strips and add to pasta along with vegetables. Toss everything to combine and serve with freshly grated Parmigiano Reggiano. If you have any comments or questions, please send me an email at wayne@waynesweekend.com.